I made the first four blocks in a sew-along that I found online. The blocks are named after women of the Bible. The patterns include cutting and sewing instructions, and a short description of that person. Two new patterns are posted on the 1st and 15th of each month and the previous patterns are taken down. 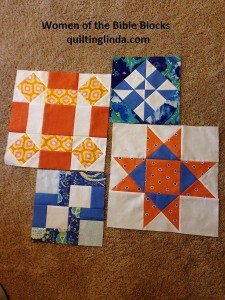 You can get these patterns by visiting this site, Prairie Quilt. I have a bundle of fat quarters that I bought last year with no project in mind. I decided they would be perfect for this sew-along. The bundle has a few large print pieces that will work in the larger blocks. The sizes of the blocks vary. I have made two that are 15 inch blocks and two that are 10 inch blocks. The names of these blocks are Rachel, Noah’s wife, Sarah and Eve. The finished quilt is 110″ X 125″ with borders. I don’t plan to make my quilt that large (it wouldn’t fit my quilt frame). I probably won’t add all the borders. There is a closed Facebook group, Prairie Quilt’s Women of the Bible Quilt Group, for people making the quilt. I have also started making blocks in a sew-along using the 1930s Farmer’s Wife book and my 30s reproduction fabrics. More about that later! I’ve been saving the patterns but I haven’t started sewing the blocks yet. Yours look wonderful, Linda! Your Noah’s wife looks perfect! The colors you are working in look fun for this time of year…bring back the sunshine!! !